NASA’s modified Gulfstream-III on the runway at Ellington Field Airport in Houston, Texas, with OMG scientists and engineers aboard. We know more about the moon and other planets than we do some places on our home planet. Remote parts of the world ocean remain uncharted, especially in the polar regions, especially under areas that are seasonally covered with ice and especially near jagged coastlines that are difficult to access by boat. Yet, as global warming forces glaciers in places like Greenland to melt into the ocean, causing increased sea level rise, understanding these remote places has become more and more important. 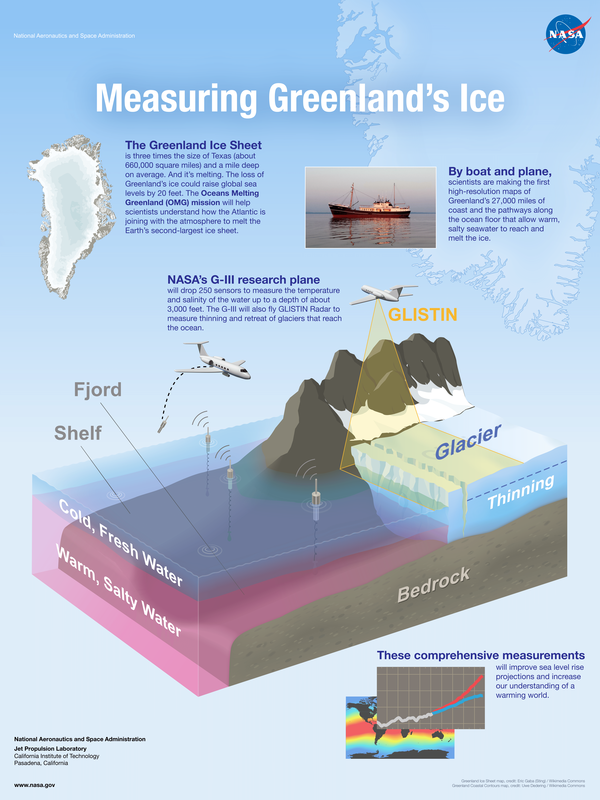 This past spring, Oceans Melting Greenland (OMG) Principal Investigator Josh Willis led a team of NASA scientists to begin gathering detailed information about the interface between Greenland’s glaciers and the warming ocean waters that surround them. The next step in accessing this extremely remote region involves dropping a series of ocean probes (Conductivity, Temperature and Depth probes, or CTDs) that will measure ocean temperature and salinity around Greenland, from the sea surface to the sea floor. With this information, they hope to find out how quickly this warmer ocean water is eating away at the ice. Since no one has ever dropped CTDs through a tube at the bottom of a modified Gulfstream-III, the OMG team headed to Ellington Field Airport near NASA’s Johnson Space Center in Houston, Texas, for a test drop into the Gulf of Mexico. I went along for the ride. Expert NASA T-38 pilot Bill Rieke executes his flight plan to rendezvous with the Oceans Melting Greenland (OMG) scientists and engineers aboard NASA’s modified Gulfstream-III at “drop one.” As soon as photographer James Blair is ready with his high speed and high definition cameras, he calls out “In position!” from the supersonic jet to the team in the G-III over Very High Frequency (VHF) radio. It’s up to Derek Rutovic, G-III program manager at NASA’s Johnson Space Center, to visually inspect the release of the CTD to make sure it does not impact the plane and then to see that the parachute opens. The first test drop was released while the plane was flying at a height of 5,000 feet and a speed of 180-200 knots. Alyson Hickey and Derek Rutovic prepare the CTD tubes for deployment. After these test flights are complete, the mission heads up to Greenland this fall, where the CTDs will measure temperature and salinity around Greenland to make a detailed analysis of how quickly the warmer waters around Greenland are eating away at the ice sheet. 3, 2, 1 ... drop! Oceans Melting Greenland (OMG) Principal Investigator Josh Willis and OMG Project Manager Steve Dinardo wait for a radio signal as the CTD sails down through the air to indicate it’s arrived at the sea surface. Once it hits the sea surface, it releases its probe, which travels through the ocean to the sea floor and sends ocean temperature and salinity data up to the team in the aircraft above, who monitor the data in real time. Both aircraft must execute a complex flight path, which involves filming two precision CTD test drops minutes apart. To execute the precision flying required to photograph the test drop of a series of CTDs, the team is briefed before and after all flights, where every detail is explicitly coordinated. From left: Flight Engineer Alyson Hickey, Oceans Melting Greenland Principal Investigator Josh Willis, photographer James Blair, Oceans Melting Greenland (OMG) Project Manager Steve Dinardo and NASA Gulfstream-III Program Manager Derek Rutovic. Laura Faye Tenenbaum is a science communicator at NASA's Jet Propulsion Laboratory and teaches oceanography at Glendale Community College.